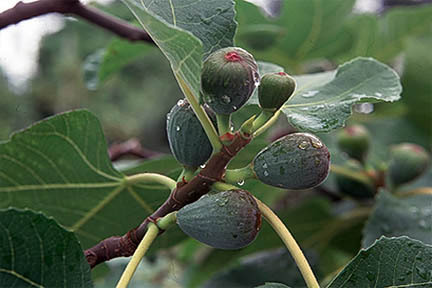 The Fig is a small tree of rounded shape and has large, bright green foliage, tending to appear very late in spring in the UK. The fruits develop throughout the summer, appearing as small green fruits by early August that gradually swell and ripen until they turn purple/brown. Ficus carica likes free draining soils, but has a preference for sheltered south facing positions. Fruiting can be maximised by planting against a wall to amplify the warmth and further increase shelter.